Lake Restoration, Inc. has the solution for you. The product finder is an easy way for you to visually see the best solution plus an alternative solution to your aquatic weed problem. If you have any questions please let one of our knowledgeable representatives help you today! Control Cattails and Water Lilies with this fast acting herbicide. Treat excess nutrients in lakes and ponds. 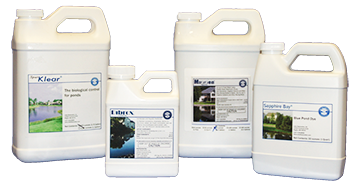 Our pond products are easy-to-use and are great at controlling floating and submerged weeds in ponds of any size. Our products are Dibrox® herbicide, Mizzen® algaecide, a nutrient reducer and blue pond dye. We recommend using these products to get you on your way to a beautiful, clear, and healthy pond.